Will Fishermans Bend meet this sustainability target? The wonderful thing for any government when preparing long-term plans is it can promise almost anything because it knows it won’t be called on to deliver on its promise. So why wouldn’t Victoria’s Andrews Government dangle the idea of “a proposed tram connection along Turner Street” in its new plan for the vast 480 Ha Fishermans Bend redevelopment site in inner city Melbourne? Why wouldn’t it go further and propose, “in the long term, a potential underground rail station” in a development slated for 80,000 residents and 80,000 jobs by 2050? The walkability score should be easy to achieve in a very dense settlement like this because it’s derived from a count of destinations, not behaviour i.e. it measures how easy walking is to places but not whether people actually choose to walk instead of (say) driving. Indeed, it’s reasonable to ask why the target isn’t higher, given Southbank and the CBD already score in the high 90s. The other two targets, however, are behaviour-based i.e. they measure how people actually travel. They’re therefore much more useful and relevant, but much harder to achieve in practice. Maybe that’s why their use in this document gives every indication of being more about marketing than good planning. How, for example, can the Government claim with confidence at this stage that 80% of trips in what will necessarily be a predominantly middle-class development (6% is slated to be “affordable” housing) will be made via “sustainable transport” i.e. on foot, on a bicycle, or on public transport? The Government wants a pat on the back for being progressive, but if it wants to be taken seriously on this target it must take action now. It’s inconvenient, but the only way it’s vision is plausible is if it imposes strict limits now on the amount of parking that can be provided in new buildings and on streets within, and adjacent to, the development. But here’s the kicker. The draft Fishermans Bend Framework provides for an average 0.5 cars per dwelling. As it says there’ll be 36,897 dwellings, that’s more than 18,000 parking spaces. That’s a lot of cars; it’s about double the number of vehicles recorded in satellite city Sunbury (SA2) at the 2016 Census. There’s an obvious contradiction here; it will be very difficult, perhaps impossible, to achieve 80% of residents’ trips via sustainable transport if on average every second apartment has a car. 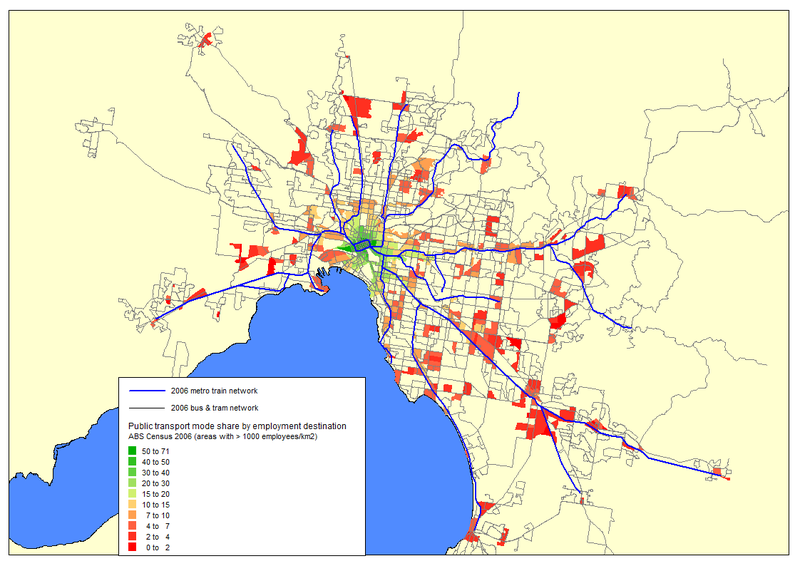 We already know from the 2016 Census that 63% of the households living in near-CBD Southbank, where 98.7% of dwelling are apartments and which has the same average residential density as that slated for Fishermans Bend, own at least one car. Bundle a parking space with an apartment, even if it’s on the doorstep of the CBD, and residents will put a car in it. Fishermans Bend residents might use cars less for the journey to work because many are likely to work in the CBD and inner city, but commuting only accounts for around a quarter of trips on average. Cars have a much higher mode share for non-work trips. Fishermans Bend isn’t a small one-off project like Nightingale or The Commons; those are single buildings each populated by around a hundred like-minded middle-class residents who self-select for a no-car lifestyle. With 80,000 residents, the demographic make-up of Fishermans Bend will necessarily be very different; it’ll be closer to the profile of the average middle-class Melburnian who likes to drive, especially for non-work trips. The idea that residents who have a car will choose to limit four-fifths of their trips to walking, cycling or taking the tram or train simply because they have those options is contradicted by experience. If the Government is serious about locking in the 80% target, it should reduce significantly the number of parking spaces per dwelling permissible within the development. The 80% target for the 80,000 jobs slated for the Fishermans Bend is more plausible, but by no means assured. At present, the mode share of public transport in the CBD for the journey to work falls off dramatically as walking distance from loop stations increases. The western end of Fishermans Bend is more than 4 km from the edge of the CBD and (hopefully and eventually) will only be served by a single rail line and a single tram line. A related problem is the sheer number of cars associated with jobs. The draft Framework allows one parking space per 100 sq. m for employment uses. At an average 10 sq. m per job, that would be 8,000 cars when the development is fully built-out; at 20 sq. m it would be 16,000. Half these would be in the designated Employment Precinct; the other half would be in the other four precincts. The target of 90% for school-related trips is also more plausible than the target for residents, but all that on-site parking for residents might make it hard to achieve. It’s reasonable to expect that the 20% – 30% of dwellings that’ll have three bedrooms will all come with parking. A relatively high proportion of middle class children in inner suburban Melbourne currently attend private or specialist schools beyond their local area. A high proportion travel to school by car i.e. 62% of primary school children, 31% of high school students, and 32% of tertiary students. It’s easy to give the appearance of being progressive today when the proof of the pudding won’t be known until 2050. If the Government wants to take the credit now for being environmentally responsible, it should put the necessary foundations in place now.